The Anchor card is about safety and remaining steadfast. It's about being tied securely to a place or a goal. It's a positive card that shows everything will be okay, and you can weather any storm. It brings a sense of stability to all readings. The Anchor indicates you've reached the harbor, arrived at your destination, and attained your goals. The Lenormand Anchor Meaning in Love: The Anchor card indicates a committed relationship. It shows settling down, faithfulness and stability. It can point to feelings of being tied down, but generally it's a positive card to see in love and relationship readings. 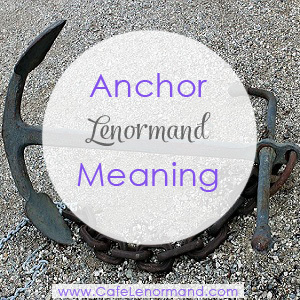 The Lenormand Anchor Meaning for Career: The Anchor means job stability, permanent positions, successful business ventures, and a long-term/lifelong career. In terms of a job, it can represent someone working at a harbor, a dock, at a beach, or other positions associated with boating. The Lenormand Anchor Meaning in Health: The Anchor card represents the hips and pelvic bone. It can indicate a condition is either long-term or stable, depending on surrounding cards. Using the Anchor for Timing: The Anchor means a long time. It refers to anything from a year to a lifetime. What can you do to feel more stable? What can you do to feel more confident? How can you ground yourself more? Don't give up. Your goal is close.